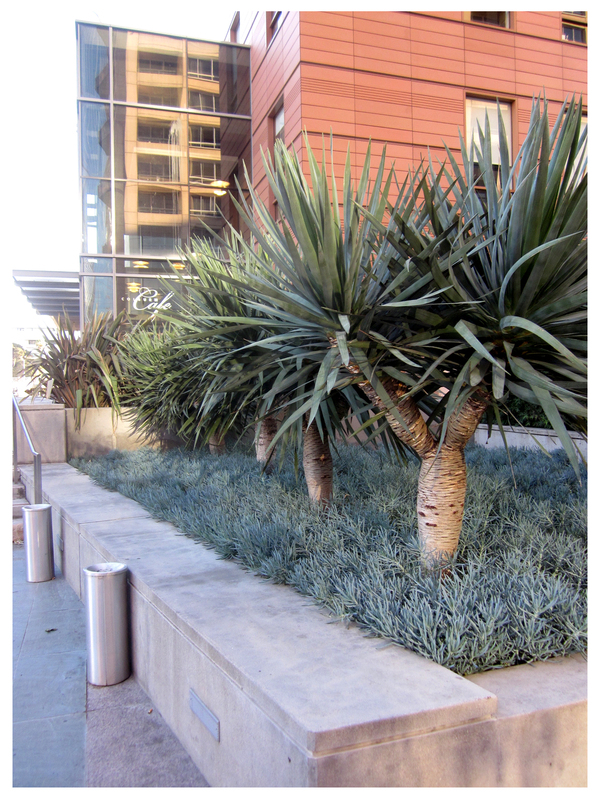 The Colburn School’s dining hall and outdoor eating area butts up against the rear of MOCA’s bookstore and offices. I was leaving MOCA’s bookstore that lunch hour I first saw them and it was hard not to follow their enthusiastic swishing, being very windy that day. While there was no wind this morning, their chubby armed pom-pom waving was still pretty stirring. 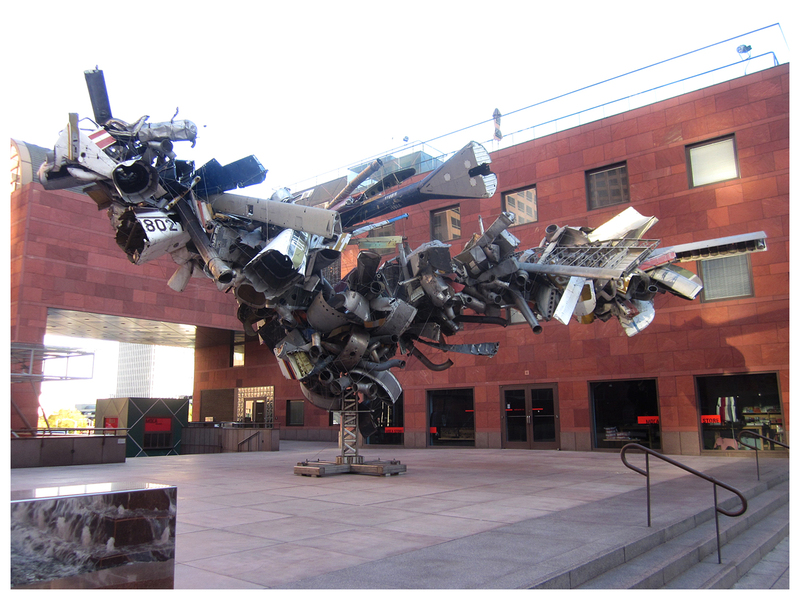 Just a few steps down the MOCA plaza and I’m in front of their bookstore and the awe-inspiring sculpture installation, “Chas’ Stainless Steel, Mark Thompson’s Airplane Parts, About 1000 Pounds of Stainless Steel Wire, Gagosian’s Beverly Hills Space” by Nancy Rubin. Installed in 2002 and on indefinite display, this explosive display of airplane parts and metal is 25-feet tall and 65-feet long! 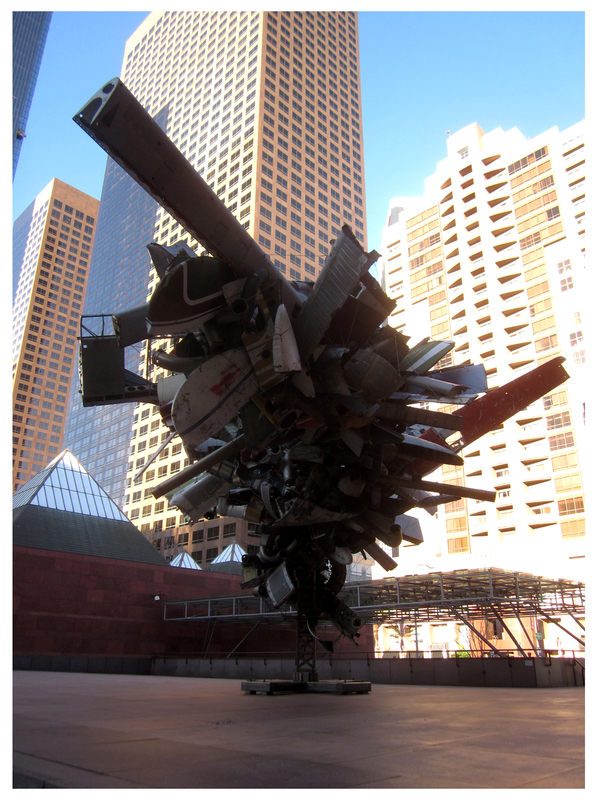 This sculpture is such a massive presence I feel exhilarated by how small I feel next to it … I’m glad I skipped the coffee! 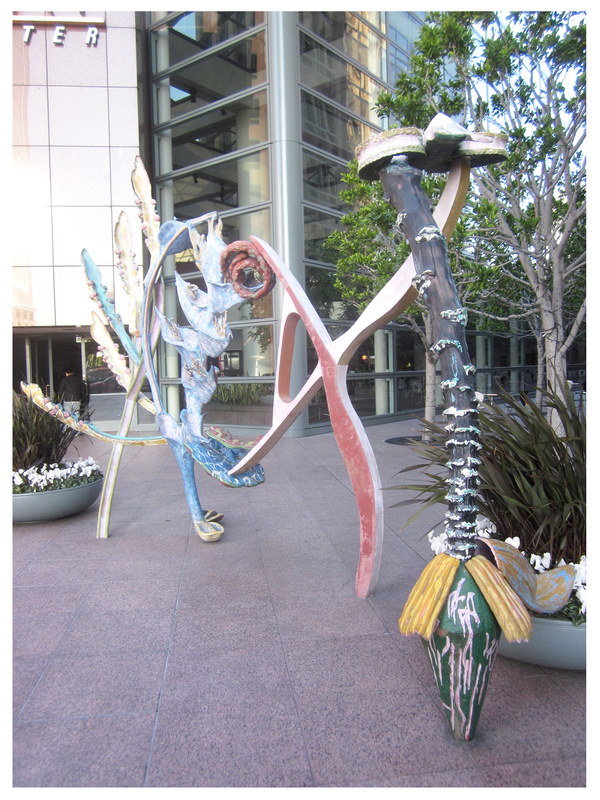 Crossing Grand Avenue westward, I head to the courtyard of the Wells Fargo Bank tower to it’s Crocker Center to visit with an old friend of mine: “Sequi” by Nancy Graves. Also metal but completely different from Rubin’s piece, this bronze walk-through installation is all about the organic and nature, and plants specifically. 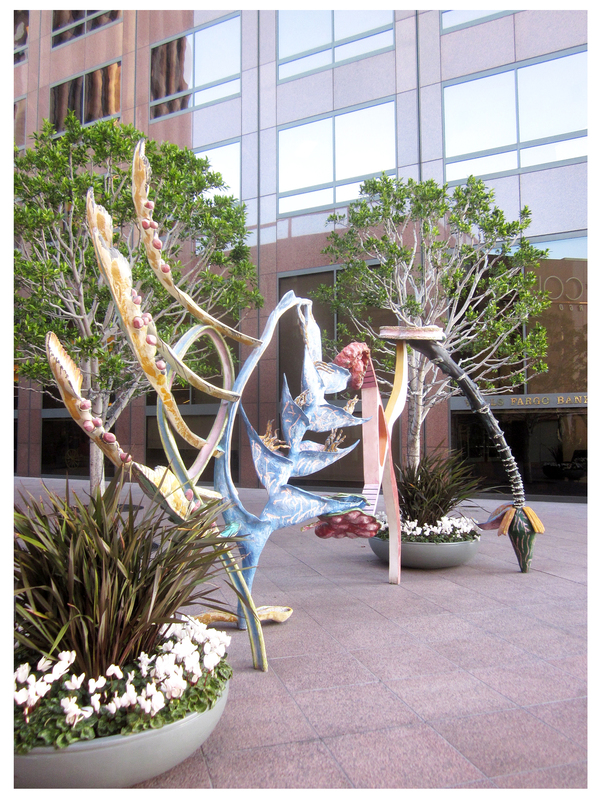 Painted in bizarre colors and twisting as if it were trying to escape its site, the sculpture is a hybridized combination of banana blossom, deerfoot fern, a lobster-claw plant and vines. It’s creepy and it’s kooky and it’s been here since 1985 … I never miss a chance to take in its gnarly charms when I’m in the area … hence, its ‘old friend’ status for me. Crossing west again, this time Hope Street, to the Bank of America Center’s park area, I catch up with another old favorite, although for the life of me I can’t find the name of the piece. 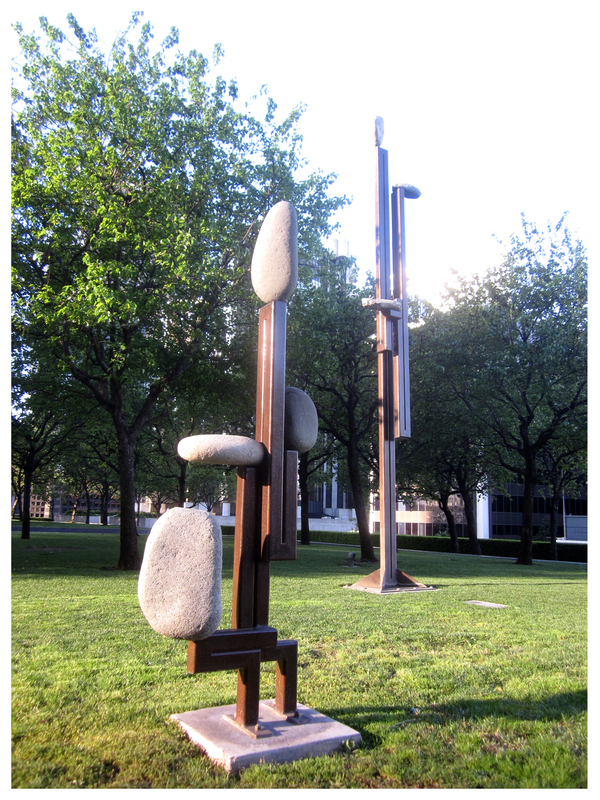 Comprised of tubular steel welded at right angles and topped by smooth river rocks, it may not be as grand in scale as the other pieces, but it’s still an old friend. 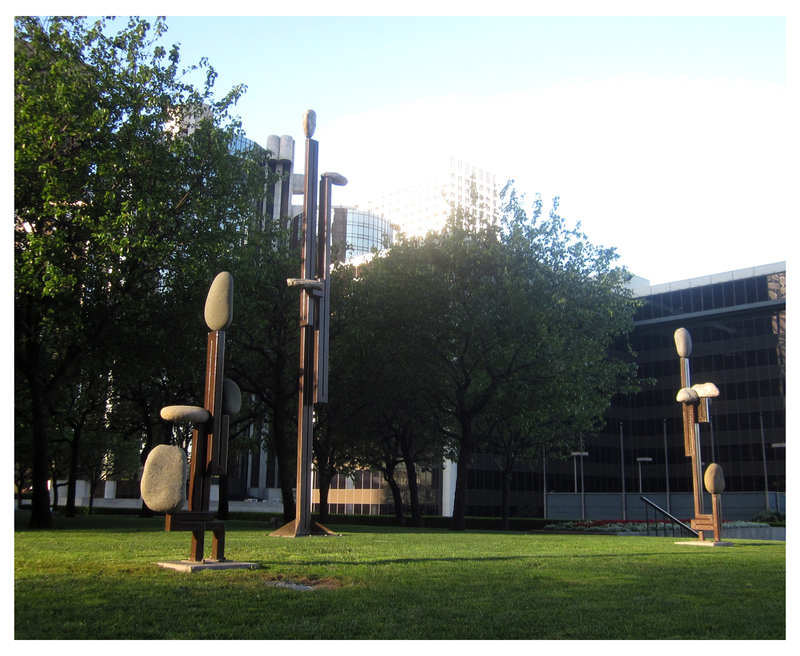 I’ve just always enjoyed how with simple materials, the artist has imbued cold steel and rocks with a person-like sense … In an open, slightly rounded, circle of grass stands these pipe-pebble people, looking slightly ill-at-ease … both alone yet with each other. 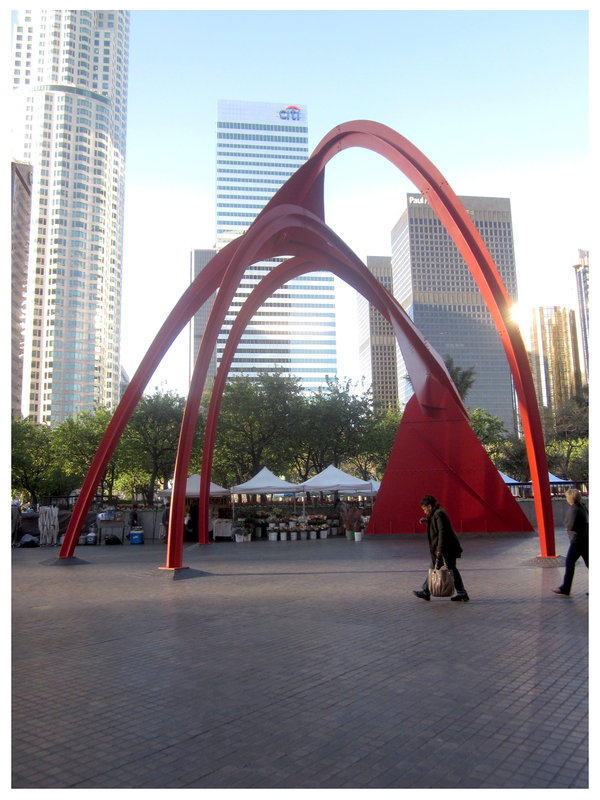 Walking eastward now (it’s getting close to office time) I approach Alexander Calder’s monumental piece, “Four Arches”. The oldest of the pieces on this morning’s tour, it’s been in place since 1975. Painted in Calder’s characteristic strong red, this is a modern masterpiece that’s always given me that big-bank-per-buck feeling, what with its massive curves seeming to crash around me. 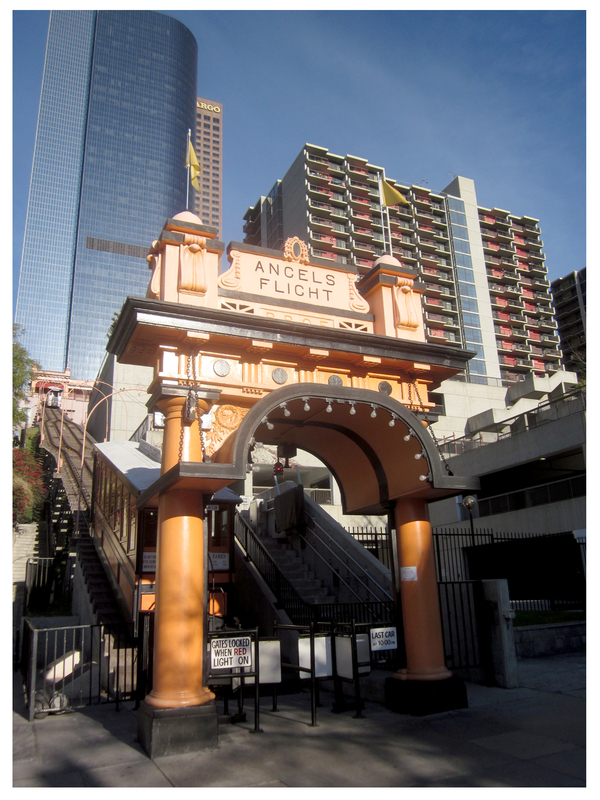 Figuring the quickest way down from Bunker Hill would be the Angel’s Flight stairway, I head east, back across Hope, across Grand, and down … onto the landing at Hill Street. Traffic’s starting to pick up now and I still have to pick up some breakfast. I wait for the light and turn to take this picture of the famous funicular’s orange-salmon gateway/ticket booth. My nature/artwalk was fun; it would be nice to hop the Flight and go back up, but I’m still employed (although we had another in a series of awful layoffs yesterday) and I’ve made a vow to myself to keep checking in so long as they’ll have me. So, it’s down eastward still, to Spring Street … I can pick up the tour some other time. These dragons — this art — will be there waiting. You’re welcome and thanks for commmenting! I do love joining you for your strolls and day trips. 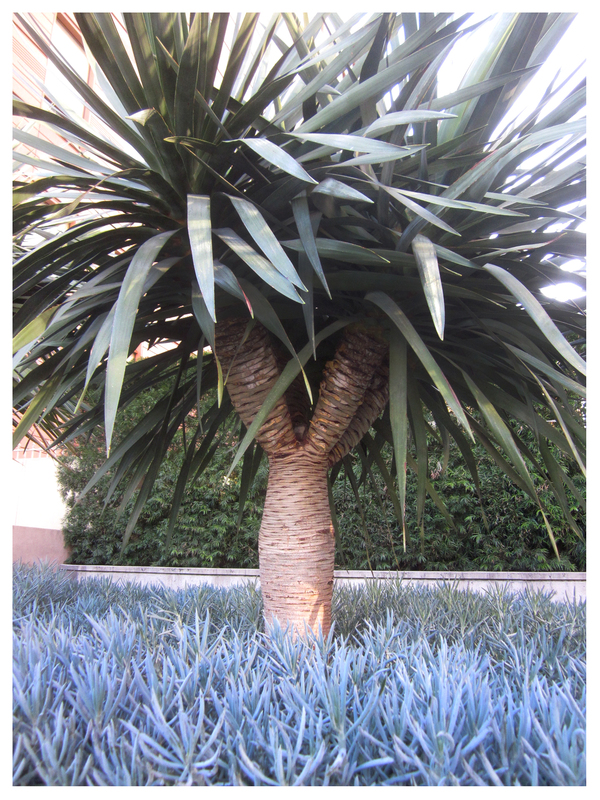 It’s been so many years since I’ve spent any time in downtown LA that I doubt that I’d recognize much. Thanks again. Thanks, Vickie … So much of this stuff would be missed if I drove!